Some of you may recognize this Christmas cookie. Our moms and grandmothers went to some work mixing up their large recipes of spiced and glazed cookies, but once they were done and stored away in a cool place, they kept for a long time. In fact, I find they taste better as they age and they do not take up freezer space. 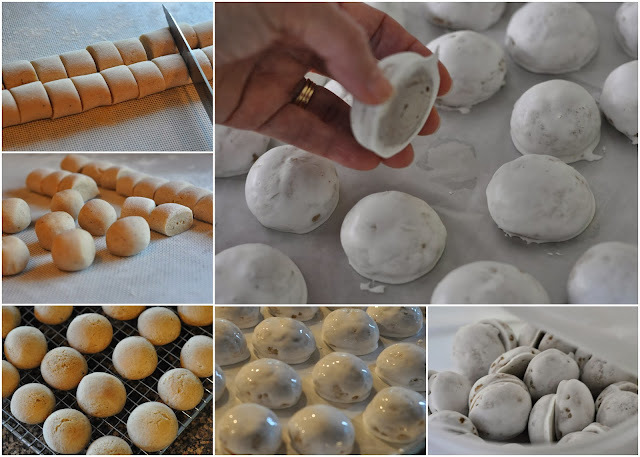 Although a recipe for honey cookies with a quick glaze method has already been posted, I'm sharing this one for variation (it does not have baking ammonia) and gives you the option of a boiled glaze. This recipe is cut in half already to make it more user friendly. It still makes 8 dozen. Bake at 375° F for about 12 minutes on upper rack of oven - no lower than center of oven. Check bottom of cookie for light browning before taking out of oven. You don't want to over bake them but you also don't want the top to sink. In a medium sized glass bowl, beat egg whites with hand mixer until almost stiff. Set aside. With mixer on, slowly pour hot syrup into beaten egg whites and beat for about 3 - 4 minutes until thick and glossy when you lift the beater. Allow to dry on wax paper for several hours - may need to leave overnight if still tacky when you lift them. I thought I'd show you the goal of what the glaze should look like. When it's cooked the right amount of time it goes on easy, and dries smoothly. If the glaze is cooked too little it will be easy to coat, but take a long time to dry into a hard icing. If you have undercooked the glaze, you will notice that it does not thicken as you beat it with the egg white. You may redeem it by adding a tablespoon of cornstarch and keep beating a few minutes more. If the glaze is cooked too long, it will dry quickly as you are glazing the cookies. It may end up being grainy, making it impossible to achieve that smooth finish. It helps to moisten your hands. The taste will still be good, just not as easy to work with. It may me easier to start again, cooking a minute less on your next try. Oh...those look so good! Even better than the ones my grandma made. Yours look so uniform and pretty. I know from experience that it takes a bit of experience to get the glaze right! I was so happy when I found my ground anise this morning. I will be baking these up yet before Christmas. The fragrance smells like Christmas. I used to make this recipe many years ago... probably the recipe was from you! Thank you so much! I've always wanted to make these like my Oma does. These cookies look wonderful! The old fashioned cookies that our mothers and grandmothers made are usually the best! Thanks for sharing this recipe. what good memories this brings! did any of your Omas or Moms make some of these with some jam inside? the plain ones were always round and the jam filled were ovals. There is also a recipe in the first cookbook. My Grandma has shared her recipe with me, you know a dash of this and a handful of that type of recipe. I love them! I have a question about where to get ground Star Anise. All I can find is ground anise which is only the seed, and my Grandma says you need the whole star. Can you offer any advise? Tammy, I use ground anise seed. Maybe it's not the same, but that is what I have. I've heard you can grind the star anise in a coffee grinder. Thanks. I also use the ground seed with good results, but my 88 year old Grandma still bakes them and misses the ground star. We have tried a coffee grinder but don't seem to be able to get it fine enough. Anneliese, what a beautiful job on the smooth icing.... so hard to create I find, yet love these traditional cookies from my Grandma and my mom... I used to make them too, but they are not my families favorite.... so I enjoy them with a good friend who still makes them ... they are a true Christmas cookie. Skye, I believe it is the glaze that keeps them fresh tasting for so long. I've had some in a cool place for over a month and they are still good. I doubt that without the glaze, they would keep like that. Why would you not glaze them? For shipping simply place them flat side to flat side in a box and layer with bubble wrap ... make sure there is no wiggle room when you shake the box. All the best! what is the reason for refrigerating the dough? Does it make it easier to handle? I want to make my mother in law's recipe (very similar) and thought it would be great to make it today, bake tomorrow. It makes it easier to handle, yes... but mostly to infuse the spices into the dough. That makes sense. you say the dough should be soft after adding the flour. The next day, it will be sturdy enough to roll out? or should it be rollable when you put it in the fridge? The dough will be on the soft side when you finish mixing it, kind of like a chocolate chip cookie batter. The next day, divide into four parts and roll those parts into 24 inch ropes. It rolls very easily. Use a bit of flour if it sticks. Slice into thick even slices ( about 1 inch) and roll into balls. I find this the easiest way to get uniformity. Hello - I tried these and they worked very nicely. Thanks for the great description on how to make the glaze - well written and very helpful! We appreciate knowing when our instructions are clear. Thank you!